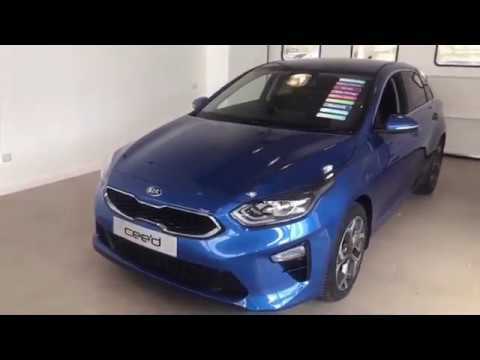 All-New Kia Ceed is lower, wider and with a dynamic and sportier appearance from the outgoing model. Straight lines replace the rounded-off edges of its predecessor, evolving the front of the car with a wider ‘tiger-nose’ grille and lower air intake, and precise, linear shapes framing its ‘face’. The new model features ‘ice cube’ LED daytime running lights as standard, echoing the appearance of earlier cee’d GT and ‘GT-Line’ models. Inside the cabin, the all-new Ceed is more ergonomic than ever, and with higher-quality materials used throughout. The cabin architecture from the most recent Kia vehicles has been adapted for the Ceed, with the dashboard laid out horizontally for a more sculptural, seamless and slimline appearance. This design also creates greater space and a sense of openness for the front passenger, allowing more space in the footwell and a clearer view ahead.